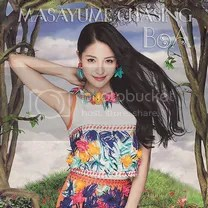 MASAYUME CHASING is the thirty-seventh Japanese single released by South Korean singer BoA on July 23, 2014. The title track was used as the opening theme for the anime ‘Fairy Tail’. The single debuted at #8 on the Oricon Charts and has sold 7,946 copies. So I knew this song for a while before the single came out because of Fairy Tail, my boyfriend was completely obsessed over that anime for weeks and weeks so automatically I was in a Fairy Tail avalanche. But MASAYUME CHASING is actually quite a good song! It’s very uplifting and breezy and the chorus is just all over the place. There’s even a little rap section further along in the song. BoA threw in the best she had and it turned out great! I’m afraid this will be stuck in my head for a while. FUN is the laid back summer song of the single and it’s not as great as the title track but it has its own charm. It’s like a little throwback to the time of ‘THE FACE’, in a good way. FUN lives up to its title and it’s quite infectuous. Serves as a good B-side and that’s just what it should be.